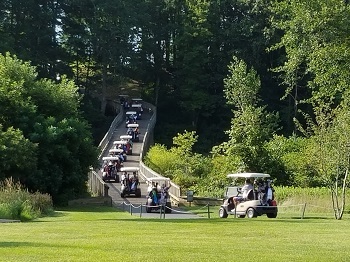 Thank you for considering the Monmouth County Park System’s Golf Courses for your golf outing. Our nationally acclaimed golf courses will surprise and delight your guests all at a tremendous value. With six different locations, we offer unique experiences tailored specifically to maximize your group’s enjoyment. We have multiple outing packages available for your next reunion, wedding party, church social, neighborhood gathering, fundraiser, or corporate event. See our outing fee structure and availability. See our optional food & drink menu including alcoholic beverages for golf outings. To reserve a mini outing, please fill out the Mini Outings Request Form. To reserve a shotgun outing, please fill out the MCPS Outing Agreement Form. To book an outing or for more information, please email golf.outings@monmouthcountyparks.com or call 732-462-9224, ext. 1#.